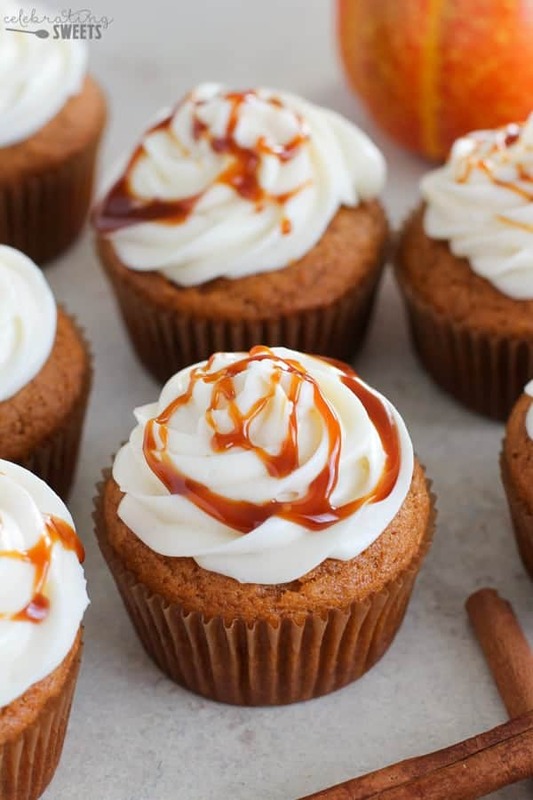 Tender, lightly spiced Pumpkin Cupcakes topped with maple cream cheese frosting. 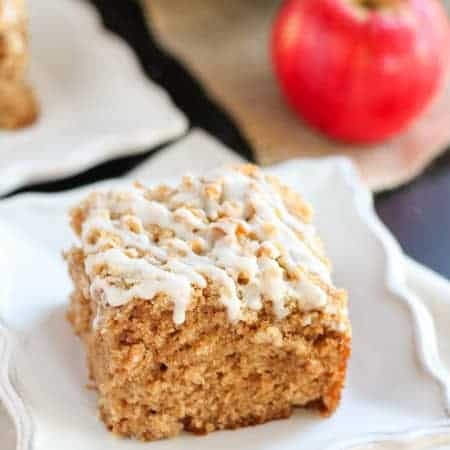 An updated, easy and elegant fall dessert! 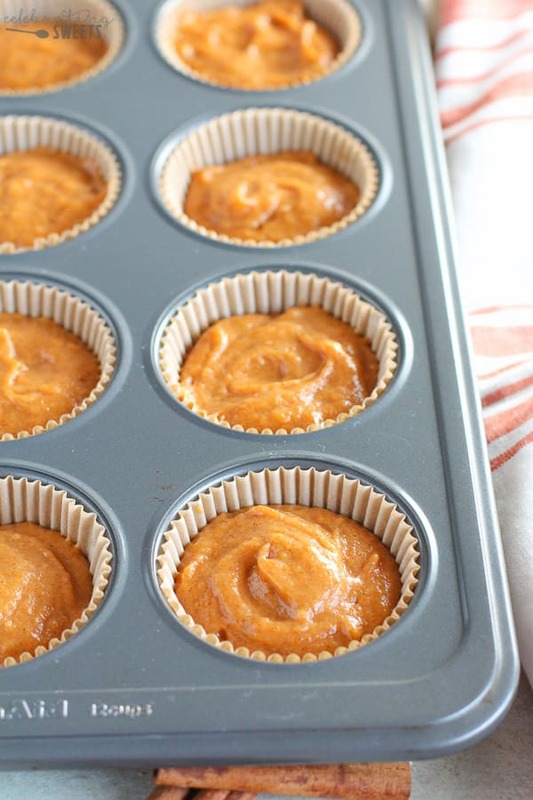 You know how the internet is filled with 97,000 Pumpkin Cupcake recipes? I am now making that number 97,001. Yes! 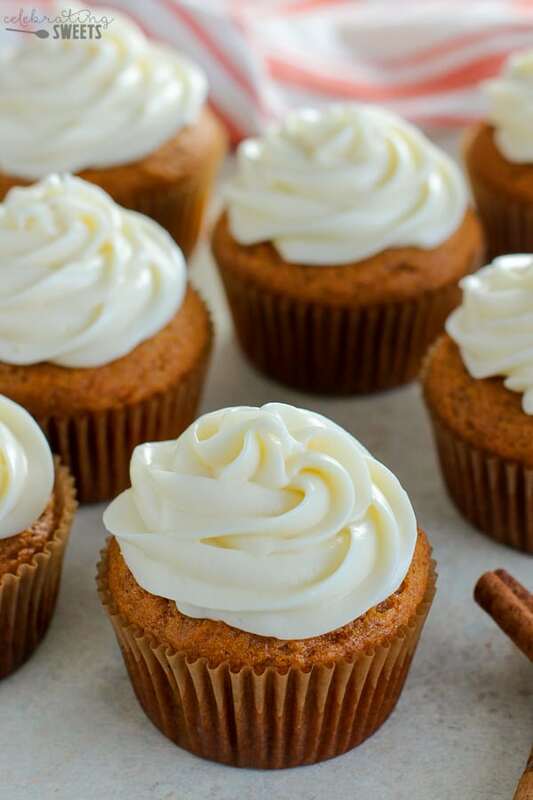 Celebrating Sweets needs a presence in the Pumpkin Cupcake market, and here it is. Truth be told, this isn’t actually my Pumpkin Cupcake recipe. It belongs to the one and only (omg-I-love-this-woman), INA GARTEN. 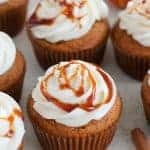 I have been playing around with Pumpkin Cupcake recipes for months. After lots of tweaks and tries, this is the recipe that I just kept coming back to. So here it is, straight from one of my favorite cookbooks – with just a few minor changes made by yours truly. 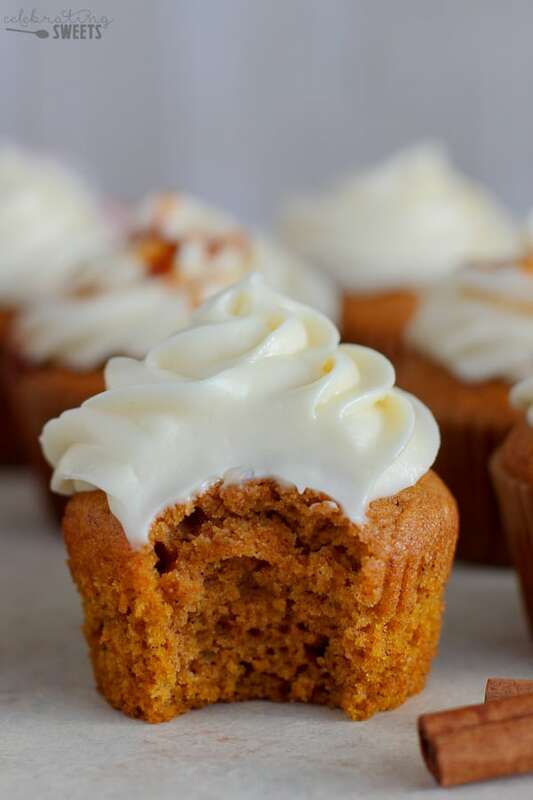 These cupcakes are filled with pumpkin, warm spices, and a mix of brown sugar and granulated sugar. Oil keeps them light and moist, and a combination of baking soda and baking powder gives them the perfect rise. The best part? They are topped with a MAPLE CREAM CHEESE FROSTING! Pumpkin cake absolutely has to be topped with cream cheese frosting. The addition of pure maple syrup really takes these over the top. Maple and pumpkin are a cozy fall match made in heaven. This recipe is super easy – you don’t even need a mixer for the cupcakes themselves. Wet ingredients get whisked in one bowl: Eggs, pumpkin puree, oil, sugar and vanilla. Dry ingredients get combined in another bowl: Flour, baking powder, baking soda, salt and pumpkin pie spice. The wet and dry ingredients get combined, then placed in muffin cups. Once the cupcakes are baked and cooled, we whip up the maple cream cheese frosting. 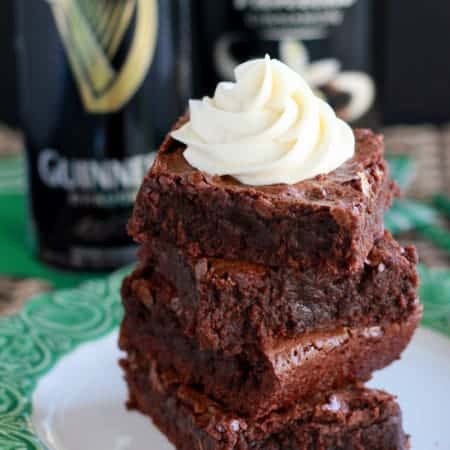 Softened cream cheese, butter, powdered sugar, vanilla extract and pure maple syrup make up this delicious frosting. The maple flavor is subtle, and if you’d like a stronger maple flavor you can also add a touch of maple extract. This Maple Cream Cheese Frosting is a tiny bit softer than a traditional frosting, due to the addition of maple syrup. It is still firm enough to pipe onto the cupcakes (as pictured), but you can also simply spread it onto the cupcakes with a butter knife. Because the frosting is on the softer side, I like to store these cupcakes in the refrigerator and bring them to room temperature before serving. Because I simply can’t leave anything as it is, I had to add my own little spin on these cupcakes with a finishing touch of salted caramel. A drizzle of salted caramel adds a sweet/salty contrast and a touch of decadence. Truth be told, you don’t have to add the caramel, the cupcakes are absolutely fine without it. But, I always have a jar of salted caramel hanging out in the back of my fridge begging to be drizzled on anything and everything (like Apple Crumb Bars and Baked Apples). Also, if it were up to me, every single one of these cupcakes would be topped with finely chopped walnuts, or even better, candied pecans! I think most baked goods are made infinitely better with the addition of nuts. I know I’m the minority here, and I did not want to scare anyone off by “ruining” these cupcakes with the crunch factor. That being said, if you like nuts, sprinkle some on top of the frosting or stir some into the batter. Also, please invite me over, because clearly, we should be friends. So, until Ina Garten invites us to a fall get together at her impeccably decorated, perfect-in-every-way East Hampton “barn,” we can make her Pumpkin Cupcakes in our very own home all season long. Preheat oven to 350. 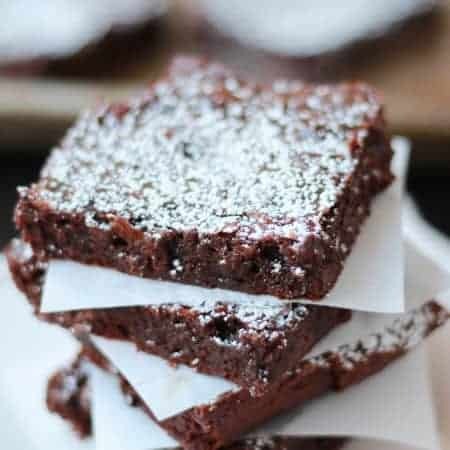 Grease a muffin pan or fill with 10 paper liners. In a medium bowl, whisk together the flour, baking powder, baking soda, pie spice and salt. 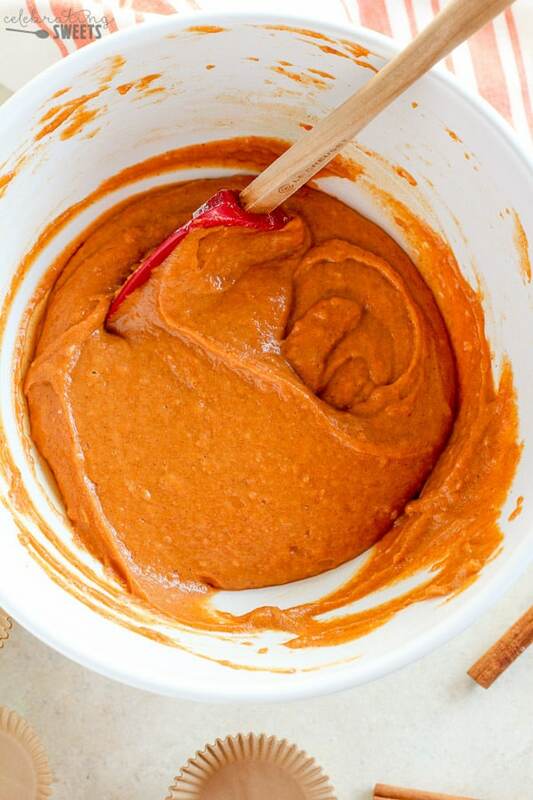 In a large bowl, whisk together the eggs, pumpkin puree, sugars and vegetable oil. Add the flour mixture to the wet ingredients and stir with a wooden spoon or rubber spatula until combined. Divide the batter evenly between the 10 muffin cups and bake for 15-18 minutes, until a toothpick inserted in the cupcakes comes out clean. Cool the cupcakes completely before spreading with frosting. Beat cream cheese, butter, maple syrup and vanilla extract and maple extract (if using) until combined. Slowly add in powdered sugar and beat until smooth. Frost the cupcakes using a piping bag and decorating tip, or simply spread the frosting with a butter knife. Drizzle with caramel sauce, if desired. I like to store these in the fridge to keep the frosting from getting too soft. Loving the maple cream cheese frosting on these cupcakes! These came out Super moist, and delicious! Perfection!